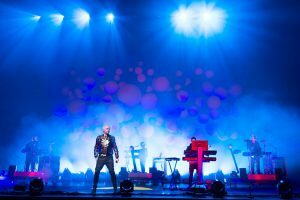 A private Victorian dining room at London’s St Pancras Hotel makes a suitably grand setting for an audience with British pop institution Pet Shop Boys. Not that award-winning duo Neil Tennant (58, elegantly suited) and Chris Lowe (53, yet almost boyish in a designer hoodie) will be stopping here long. They’ve just arrived back from a triumphant Manchester show on their extensive Electric tour and they’ll shortly be off for their next date in Tel Aviv. Frankly, stranger things have happened in Pet Shop Boys’ productions. An adventurous air has always stirred beneath their deadpan demeanour and their latest tour heralds the release of their 12th studio collection, also titled Electric. Both the concerts and the album have involved 35-year-old Brit producer Stuart Price (also famed for his work as Madonna’s musical director). Electric’s tracks – the racy Hi-NRG rush of Axis; the euphoria of current single Vocal; the ‘living for the weekend’ urge of Thursday (featuring a cameo from pop star/rapper Example) – form a sharp awakening after Pet Shop Boys’ reflective 2012 predecessor, Elysium. This album comes at a time of flux – it’s Pet Shop Boys’ first release on their own label since leaving British major Parlophone (recently bought by Warner Music), and it sounds like pop’s elder statesmen have reclaimed their roots on the dance floor. Club culture has been key to Pet Shop Boys’ music since the duo’s early 1980s Hi-NRG recordings with New York dance producer Bobby Orlando. They signed to Parlophone in 1985 and scored their debut hit, West End Girls, shortly afterwards but those underground obsessions still pulsed through their work: a fascination with nightlife and gay culture; imported vinyl and alternative versions. Pet Shop Boys arguably deserve credit for bringing club remixes to the mainstream; their successful Disco mix series began in 1986 and they’ve always enlisted pioneering DJs to rework their tunes. They’ve stayed in touch, even if they’re not always out all night. The classic dance elements on Electric surely owe something to the fact that producer Price is a long-time Pet Shop Boys fan; Disco was apparently the first record he bought and his breakthrough musical guise (as pink-haired club artist Les Rythmes Digitales) championed 1980s-styled electronic production.